An A$18 million Briquetting Plant at the Port Kembla Steelworks will result in a significant reduction in the amount of by-product material stored at the Company's Port Kembla recycling area, known as '21 Area'. This environmental improvement project will address some of the few remaining by-products that cannot yet be fully recycled into the steelmaking process. The Filter Cake materials from the gas cleaning systems at the Blast Furnaces and Basic Oxygen Steelmaking Plant cannot currently be recycled, due to their physical and chemical properties. The Filter Cake is produced from fine dust captured in the gas cleaning systems, and is too fine to be recycled into the Sinter Plant. Its zinc concentration is also too high to allow complete recycling through the iron and steel making processes. A range of technologies to treat and recycle these materials was investigated, before briquetting was chosen as the most appropriate way to reduce this waste stream. The Briquetting Plant will be owned and operated by steelworks scrap contractor Multiserv. Trial production of briquettes has been carried out, using a small pilot plant. Briquettes produced in the trial have been successfully consumed by No 6 Blast Furnace and the BOS. Construction of the Briquetting Plant has proceeded throughout 2004, and start up is planned for early 2005. Once fully operational, the Briquetting Plant will prevent the stockpiling of approximately 64,000 tonnes of Filter Cake each year. An innovative grinding mill processes granulated blast furnace slag from BlueScope Steel's Port Kembla Steelworks into a cement substitute for use in a range of construction projects. Around 600,000 tonnes of granulated blast furnace slag is produced each year at the Port Kembla Steelworks. Granulated blast furnace slag is produced when molten slag is passed through a trough of high pressure, high volume water sprays. It resembles river sand and is used primarily in the cement industry and in road base. The $18 million Ecocem grinding plant further processes the granulated slag to produce Ecocem, a cement substitute with improved performance and durability. The plant, which began operation in 2001, is owned and operated by Australian Steel Mill Services (ASMS) and has the capacity to produce up to 250,000 tonnes of cement substitute each year. In addition to making good use of a waste product from the steelmaking process, Ecocem has a number of other environmental benefits. Every tonne of slag granulate used in cement saves one cubic metre of earth being dug up to mine limestone used to produce clinker, which slag replaces. Every tonne of slag granulate used also saves one tonne of greenhouse gases, as carbon dioxide is driven off in the production of cement clinker, but granulate just has to be ground. Ecocem now has an estimated 25 per cent share of the Sydney and Illawarra cement markets, with clients including councils and concrete companies, and was used in the Sydney Harbour Tunnel tube segments, replacing up to 65 per cent of the ordinary cement used in the concrete. The Ecocem plant is now at 50 per cent capacity and should be fully operational over the next 18 months. Once the plant reaches its full annual capacity of 250,000 tonnes, ASMS will be significantly closer to the full utilisation of all the slag produced at the Port Kembla Steelworks, eliminating the need for on or off-site storage. 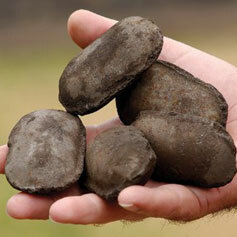 Briquettes were chosen as an appropriate way to reduce waste.